• Great Basin Holiday Gifts are in Season! Will you be doing a Scytale 404 release for 2016? Thanks for writing in. We sure had a lot of fun doing Scytale this year. We're not quite ready to tell you what's up our sleeve for 2016 just yet, but as soon as we are, we'll let you know! With the cold weather, our brewers have been staying in, keeping warm by the heat of the brewing kettle. 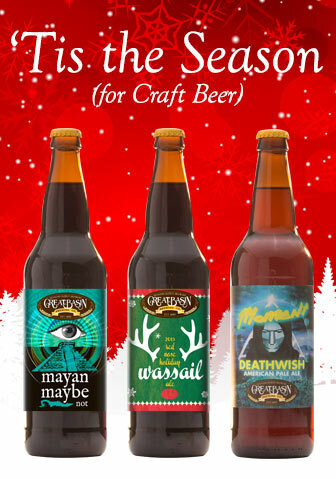 They’ve outdone themselves yet again with an array of incredible craft beer for the holiday season. These three beers are available in limited quantities, enjoy them while you can! This American style pale ale combines sweet caramel and toasty malt flavor with a backbone of tasty hop bitterness and pungent citrus hop aroma. A collaboration with Moment Ski Company of Reno, NV. This brew pours with a gently hazy golden to light copper body. It gives off aromas of pine & spice, with herbal and grapefruit citrus. On the palette, it’s hop-forward with roasted caramel & biscuit flavors with accents of herbal, floral, spicy & citrus hops. First brewed to celebrate the end of the Mayan calendar in 2012, this beer marries ingredients the Mayans cultivated – chocolate, jalapeño & habanero chiles, vanilla, honey, & maize with subtly-smoked malts. This brew pours a dark brown body with ruby highlights. It features aromas of chocolate, chilies, sweet caramel, and vanilla. On the palette, flavors of bittersweet chocolate, dark malts, spicy peppers with a hint of smokiness. Our 23rd edition of this festive beer, Red Nose Holiday Wassail has kept its base recipe each year – sweet, malt-forward with a substantial addition of local honey and a biscuity finish – but the spices continue to change based on our personal whims. This year we’ve included apple, honey, coriander, nutmeg, cinnamon, ginger, allspice, orange peel, chamomile, woodruff, heather tips, elderflowers, maple, and vanilla. A limited edition of only 400 - 22 oz. bottles will be available this season, each signed and numbered by our Brewmaster, Tom Young. These always sell out, so seize the opportunity or have yourself a very dry holiday. Come down to Victorian Square on Friday, December 4 from 6:30-7:00 pm as we gather ‘round the tree to watch Mayor Martini turn on the glorious lights. This wonderful family event includes great entertainment and treats for the kids. Come and be a part of the fun, and when it’s all done come celebrate with a pint of fresh Red Nose Wassail Holiday Ale at our Sparks brewpub. Come downtown on Saturday, December 5, 2015 for a traditional Christmas parade from 1:00-3:00 pm and enjoy entertainment, photos with Santa, and arts and crafts. 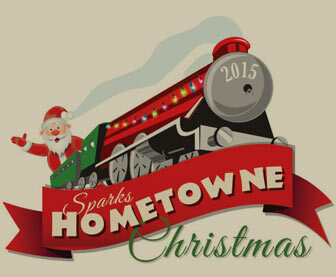 This year’s theme is “All Aboard The Hometowne Express!” Parade goers can expect whistle stops, box cars, train engineers, and Santa bringing up the caboose. As we round the corner into the final stretch before the holidays, we know things can begin to get a little stressful. Having to worry about a holiday party may just be the final straw. Fear not! There’s still time to book your holiday party at Great Basin’s Reno or Sparks brewpubs. Call us at 775.355.7711 (Sparks) or 775.284.7711 (Reno) to check availability. Welcome 2016 with great friends, live music, and local craft beer. 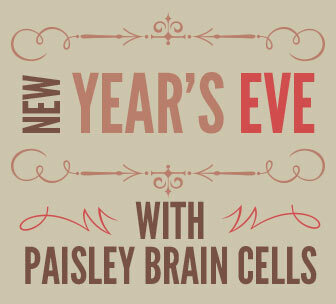 To say goodbye to 2015 we’ll have Paisley Brain Cells playing at our indoor stage in Sparks. Tickets are just $15 and feature complimentary champagne at midnight. The show begins at 10:00 pm. 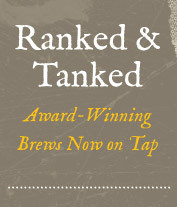 Call our Sparks brewpub at 775.355.7711 for ticket information. New Year’s Eve Food Specials at both Reno and Sparks brewpubs will feature Prime Rib, Surf and Turf (steak and prawns scampi style), Portobello Raviolis, and many other delicious tastes. Make plans now to stop in at our Reno brewpub* for a great meal before heading out for the countdown or in Sparks come early and stay for the show! *Our Reno brewpub will close at approximately 10 p.m. New Year’s Eve. We’ll be closing our brewpubs on Christmas Eve beginning at 4 pm through all of Christmas Day. We wish you and your loved ones a safe and very happy holiday! We’ll open back up at 11 am on December 26th. Swing on by after you return the Whitman’s Sampler that aunt Patty gave you for Christmas. Great Basin Holiday Gifts are in Season! Red Nose Holiday Wassail Almond Beer Brittle is here! Pick up yours for just $5 each. And of course the gift that's always in good taste: Great Basin Gift Cards - for every $25 in purchase, you receive a $5 coupon. 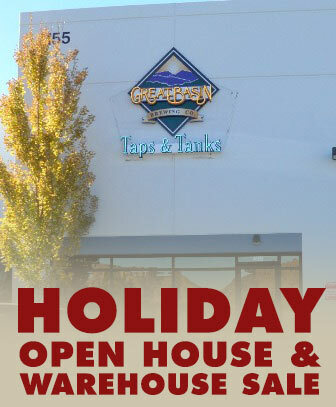 Come by our Taps and Tanks location on Saturday, December 12th from 10 am - 5 pm for a holiday open house. There’ll be a food truck, hourly brewery tours, gift shop items (shirts, glassware, etc. ), and huge discounts on cases of beer. Don’t show up to all of your parties empty handed this year – load up on Great Basin beer and spread the joy.